Every bathroom has to satisfy a certain criteria, housing a sink, toilet and shower or bath. Any more than that, and you can consider yourself lucky, as most bathrooms are small spaces, tucked into a nook or added on to a bedroom. If your space is lacking, every detail counts. At G.Vega Ceramica, we’re not just inventive with our handmade bathroom tiles. With the case of our bespoke work, and sometimes when clients ordering our ready made ceramic wall art sets, we’re asked how best to work our designs into a little bathroom. Our experience as designers has lead us to help design many bathroom tiles and you only need to follow a simple set of rules if you have a smaller bathroom space that you’d like to tile or redesign. Often, it’s these pint-sized bathroom designs that can have the most astonishing impact, thanks to careful planning and an eye for detail. As we have recently added our bespoke field tiles to our online shops (price per metre), we thought laying out a simple guideline on using tiles in a small bathroom space would help to inspire our clients. First things first, the size of your bathroom tile is probably going to be the initial choice. It used to be said that smaller tiles were the best option for tiny bathrooms. But, on the contrary, the more tiles you use, the more grout is needed in between each one which can create the look of a grid and overall, making the room feel more boxed in. You also need to consider how much of the bathroom you’d like to tile. Some people decide on just a splashback for the sink and in the shower, which can look sleek. The G.Vega wall art sets make beautiful and eye catching splash backs in bathrooms and kitchen and can work well in smaller rooms. All of our tiles are handmade and made to order. Differences in size, colours and crackle are desired characteristics of handmade ceramics. We like to call these the “perfect imperfections” and show that our tiles are not factory made. 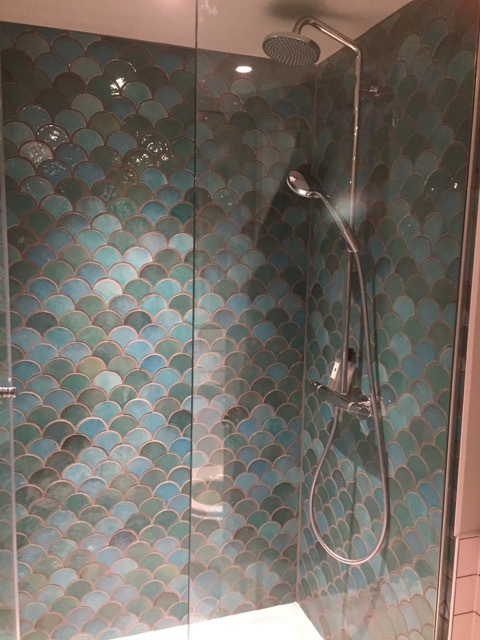 If you’re using tiles on the walls in most of the room, our medium sized fish scale tiles or Arabesque tiles work well. The gloss finish on these tiles reflect the light so if you have a bright but small bathroom, you can easily add a backdrop of these tiles to help create an illusion of space. We hand dip each tile, sometimes two, three, or four times, so every time the tile will have a different coating. With each colour used there is a range of hues seen within one colour. This effect is more prominent with shiny/crystalline tiles and the matt tiles are more uniform.You can also choose a selection of different colours for more variation of tones. Lighter tiles will reflect more natural light and help the bathroom feel more roomy. White and cream palettes are more traditionally used in bathrooms but don’t be afraid of dark colours. A darker tile of, say turquoise or blue, can add depth and unique impact to a space. If you are leaning towards a darker colour, take into account the light in the room. If it’s bright with big windows, or you can easily add necessary lighting, the room will automatically feel more spacious. 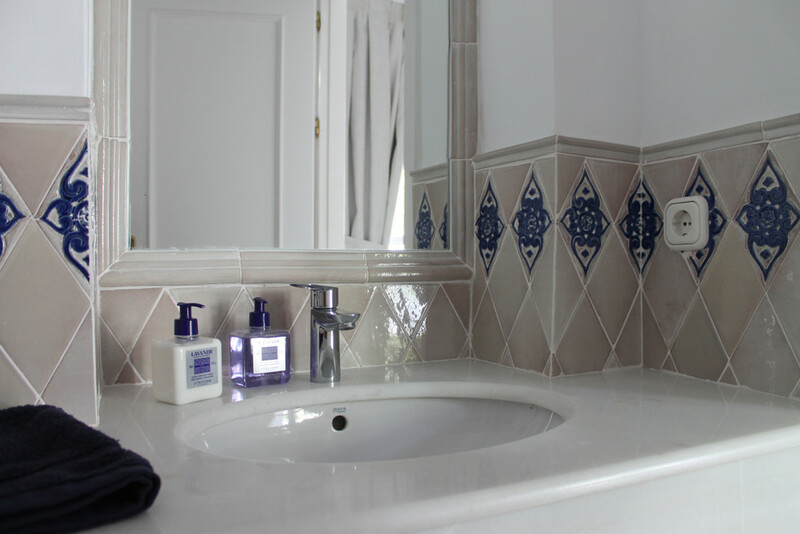 Our white and beige ceramic tiles have a matt finish and look elegant in bathrooms but add an extra depth thanks to our trademark deep relief carving on each tile. There isn’t just the tile colour you need to think of, you should also think about the grout (the filler between each tile). Unless you want to make a statement or show contrast, pick a shade of grout matching your predominate tile colour. This will help the tiles look seamless and less dated as time goes on. A medium grey often works well as it’s neutral and works with all colours. You can be creative with simple square tiles. Have you considered laying them as diamonds, for example? Or straying away from the typical square tile all together? G. Vega has a number of designs which don’t conform to the rules. The Arabesque and picket tiles are hand-painted in any colour but even in neutral tones, the shape works to create an impact. Our handmade ceramic field tiles can be ordered per metre on both our website and Etsy shop. Some of our favourite bathrooms have been kept more simple - working with tile shapes and colours, rather than our decorative tiles. Seeing and touching our tiles over over-exceed seeing in a photo. Handmade tiles have a certain energy that industrial tiles just don’t have. Order tile samples just as you would with paint when painting a wall. Then you can see the tile in the light of your bathroom; the gloss, the colour match, the finish, the thickness of the tile. Only then can you get a true idea of how the room could look. So, you’ve picked the tiles, so what’s next? It’s important to next think about what height you want the tiles up to. Multiply the width of the room by the height of tiles and hey presto, that’s the m2. It’s always a little more complicated than that of course but we are here to help. If you have a builder / tiler, they will of course help you calculate the number of tiles you need, based on the dimensions of the bathroom and size of the tile. If you’re doing the tiling yourself, there are several calculators available online to help you get the right measurements but we can help if you’re buying our tiles and have the dimensions of your room. If you haven’t yet decided how much of the wall space you’d like tiled, look at the fixtures and fittings in the bathroom. If you have free standing fixtures such as the sink, consider a splashback. If your bathroom has a significant amount of in built storage around the fixtures, consider tiling along the wall so that there are no odd gaps of space and fewer transitions. Finally, here are 5 quick tips to help anyone with their overall bathroom redesign.